I’ve been meaning to write about this for a while now, but I keep forgetting. In that sense then, this news isn’t exactly breaking or anything like that, but I still think it’s worth commenting on. It’s really strange to me that in 2013 (getting closer to 2014 all the time), simply having a certain type of tattoo can still get you into trouble in some parts of the world. That’s a really bizarre thing, isn’t it? Back in March of this year, Antony Ratcliffe of Nottingham, England was stopped by customs and immigration officials when he tried to leave Sri Lanka’s Bandaranaike International Airport during a 12-hour layover. He was held in a detention area for an hour and half where immigration officials studied his passport and took turns angrily scrutinising him. Ratcliffe’s crime? 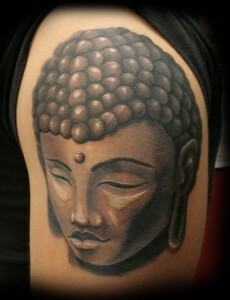 Having a tattoo on his arm of the Buddha. ‘Despite having a valid two-day tourist visa, Mr Ratcliffe said he was frogmarched to a detention area after immigration officials spotted the Buddha’s head tattoo poking out from the sleeve of his T-shirt. Ratcliffe, who is a Buddhist himself, was understandably stunned by this reception. He was eventually released and permitted to fly on to his final destination of Kuala Lumpur, Malaysia, but upon arrival there he was questioned further by Malaysian officials. Aside from this being completely and utterly insane, it does make a valid point in that no matter how rational and meaningful your tattoo might be to you, it isn’t always going to be perceived that way by others – especially in foreign countries. Ratcliffe is 100% justified in any anger or confusion he feels over this experience. But this should be a warning to others out there with similar tattoos. Sri Lanka is apparently not a tattoo friendly place to those with tattoos of the Buddha so if you’ve got ’em, it might be best to skip that destination. Yes, it is sort of like you’re being punished despite having done nothing wrong, but if Sri Lanka isn’t going to support your basic freedoms and beliefs, why give them your tourist dollars? Go somewhere else. It’s also worth checking into detailed information regarding various cultures’ stances on tattoos before venturing to various countries. It could end up saving you a lot of grief.